Have you discovered that some rods and flies seem made for each other? 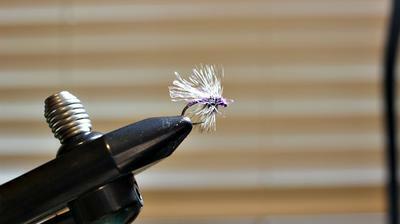 In recent outings I’ve found that the Nissin Air Stage Hakubai 240 and a purple “Reaper Midge” are just such a pair. The super-light Air Stage delivers the dry fly midge with the whisper of a kiss, and panfish find the combo hard to resist. I started tying the Reaper after reading about it and watching several videos on the Internet. It’s not too hard of a pattern to tie, even with shaky hands, and the fish don’t care if it’s a little sloppy. I use sharp Daiichi 1120 size 14 hooks, which is a size or two bigger than most anglers. 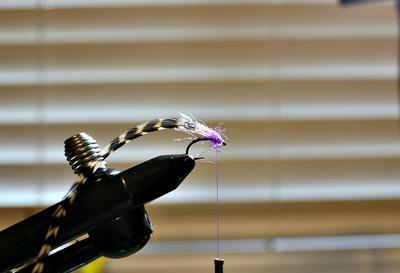 I also use purple thread, purple flashabou, pearl crystal flash, purple Ice Dubbing, and grizzly dry fly hackle. The first three photos above give you the general idea. Again, there are plenty of instructions on the Web to get you started, plus factory offerings if you don’t tie your own. The Air Stage Hakubai and Reaper Midge work well for several reasons. First, the rod and fly make for a delicate presentation. If you do your part, it just doesn’t scare the fish. Second, the size and color work well for most panfish. 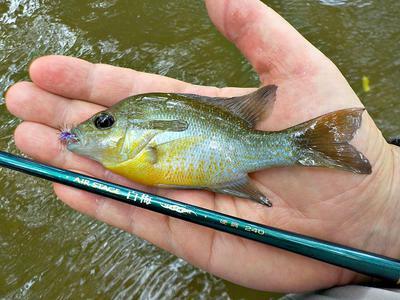 In my experience, Yellow Bellies (Red Breast Sunfish) will charge the fly from several feet away. Third, this fly is very buoyant. Just one or two false casts are enough to dry it out and keep it riding on the water. Finally, even if the fly becomes waterlogged, the fish still hit it as a wet fly. 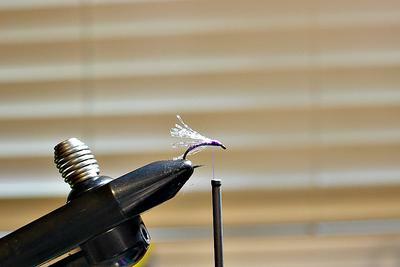 Some dry flies lose their effectiveness when they begin to sink. The Reaper Midge keeps on catching fish! Whatever it is in a fly pattern that triggers strikes, this midge seems to have an extra dose of it. Usually, I just cast it lightly and give it the barest twitch or two. Let it sit still for a while — five or ten seconds. Patience pays off. The Reaper has just enough flash to work well, even on cloudy days or in stained water. Is there not something special about seeing even a small fish explode on the surface? The Reaper is one of those patterns that’s made for soft tenkara rods. At least the panfish in my rivers and streams smack it with gusto. I sure didn’t design it, but I appreciate whoever did! Match it with the Air Stage Hakubai, or similar rod, and you have a winner. John - Great report again! However I am in the struggle between spending my time this afternoon between Birds or Bluegills. I'm going to tie up some of your midges, but will fish them with the Kurenai 30. Thanks for sharing. One thing I have realized is that I have not worked on my casting skills with my Tenkara rods fishing dry flies. There are always new things to learn in this hobby. The Suntech Kurenai 30 will be an excellent fit for the Reaper Midge. I've been fishing a little neighborhood creek lately, using a slingshot cast to work the midge under the tree branches. The slingshot cast floats the fly very softly, and you can see the sunfish slam the fly from a yard or more away. The Air Stage Hakubai or Kurenai 30 will let you work those tight, brushy spots, for smaller fish, in an effective way. I've found the less I move the fly, the better my results. I look forward to hearing your results! Another interesting and useful report, John! You hit on a topic that many beginning anglers don’t know and few books and articles mention, that dry flies often catch fish when sunk and it’s best to fish out a cast rather than yank the fly out for another cast. One thing I’ve also found is that dries, especially down-wings like the Elk Hair Caddis (and your pretty Reaper), very often work just as well and sometimes better when sunk. One day years ago on the North Platte River behind a motel in Saratoga, WY I was fishing a #14 EHC across stream and when it sunk I began stripping it back fast under water when a trout hit. The trout loved it! So for a couple of hours I’d fish it dry on a slack leader and if it got no strikes when the fly began to drag I’d jerk it under and strip it back. Now I customarily try that tactic with any down-wing dry. Sometimes it works, not always, but enough to give it a try. Why does it work? My only guess is that the action mimics diving egg-laying caddis. On another long-ago day I was having pretty good action on a Michigan stream fishing a #12 Humpy upstream. It became waterlogged and sunk after several browns and bows were landed, but the crazy trout kept nailing it under water. Frankly, the Humpy looks to me like a squatting jack rabbit when seen from the side, but whatever the fish thought it was, they kept chowing down on it until I quit. Does anybody just let the fly hang at the end of the downstream drift? I’m betting you do, but again it’s a little written about tactic. Sometimes it’s the only way to work a tough lie. The point is, we really don’t know what our flies look like to a fish; maybe just something buggy, and it’s the fly in or on the water that catches the fish. Thanks for introducing the subject, John. Thanks for your notes and experience. I, too, have caught several good fish on an Elk Hair Caddis jerked under water. I don't feel guilty when I catch a fish on a dry fly that's fished wet! I also like the Humpy, but I'm always wondering what the fish see in that fly--I can't tell if it's going or coming! You're right: We don't know exactly what fish see in a particular fly or what triggers a strike. Experience is the best teacher. In angling, we learn by doing.